As is the same every year the last day of the year and the first day of the year are my busiest for sorting sponsorship of UKS. 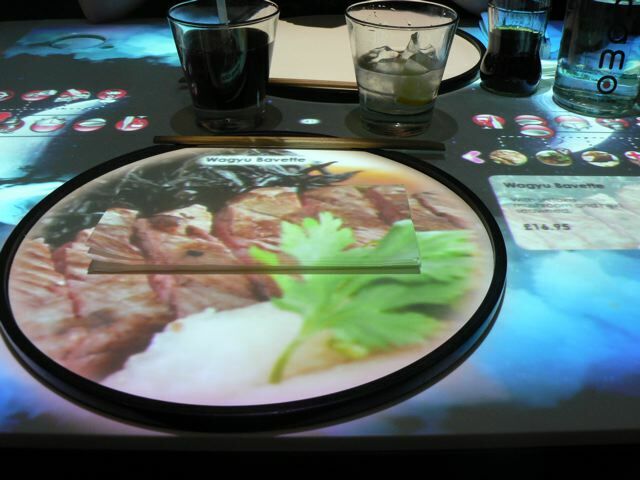 In anticipation of the chaos, we slipped in to London for a couple of days – a belated birthday meal for me at my fave fun restaurant Inamo,which has good food, if on the pricey side, but the real draw is the interactive tables. 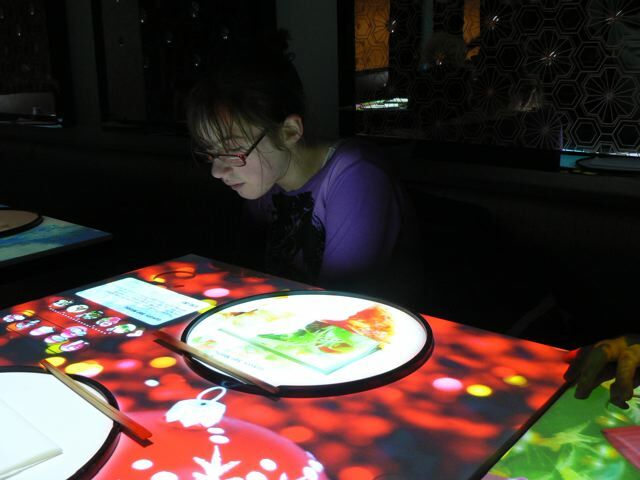 DD spends the whole meal changing the patterns, browsing the menu and has been know to try to call a taxi if we don’t keep a close eye on her! She loves looking at the food and watching the chef-cam. 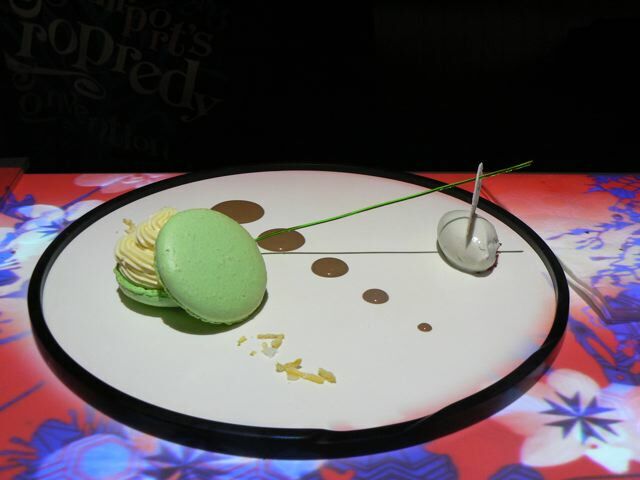 It’s always a fun experience and the presentation is very scrap-friendly – check out DS’s dessert …. We spent a bit at Paperchase, as you do (got myself a very cute tea flask with cup, decorated with owls) and I scored some tiny little mister bottles at Muji, although they are surely not the best price for such things. Impulse won out over sensible spending, I’m afraid. We waited outside a magic shop under Charing Cross and were JUST on the verge of leaving when someone rushed up to open the shop about an hour later than advertised. But managed to get DS a couple of specialty Arcane decks, which aren’t intrinsically magical, just very pretty to look at. Once DS has scuffed them up a bit and they don’t spread as nicely I may take a few for altering/scrapping. They are lovely. DS and I went to see An Inspector Calls, although I was more interested in Rope at the Almedia (we lived just across and down the street a house or two from there once) but I lost that battle. Great production, but SO uncomfortable in those tiny seats with no leg room at all. Note to self – NEVER book anything but an aisle seat, ever. Tried to hit Avatar in 3D at the Imax but it was booked for a week. Now, home, awaiting a City Link delivery they first sent out on the 17th which still hasn’t even been attempted, just goes on the truck then back to the depo every day. Why? LOADS of other stuff has been delivered no problem, but not the main package that has all the best stuff in it! Still the kids are enjoying the neverending Christmas LOL! So Happy New Year to anyone who actually sees this and hopefully it will be back to scrapping in the New Year. Categories: non-scrapbooking | Tags: cards, food | Permalink. WOW, I live in London but never heard of that restaurant! Will definitely have to visit now!